For a while, I feel like I have been meandering through a morass of similarity. Fantasy worlds based in a fairly commonplace Western European medieval setting, conservative in its representation of social mores, and an overall lack of nuance in dealing with gender or sexuality. Sometimes it seems like much more time is spent creating an interesting magic system and fascinating world than making sure the people inhabiting the world feel real to life. But at last, with N.K. Jemisin's The Killing Moon, I find a book that eschews the medieval European setting and treats social norms and mores in a fascinatingly complex manner. And it's damn good to boot, featuring fantastic prose and a compelling story. The Killing Moon, the first book of Jemisin's Dreamblood Duology, takes place in the city-state of Gujaareh, a city based on ancient (New Kingdom era) Egypt. That much is clear even to the interested layman, with the desert setting, regular flooding cycles akin to those of the Nile River valley, the polytheistic society, and a Prince who serves as an intermediary between gods and men--not unlike the Pharaohs of old. And the relations between the lighter-skinned people of Gujaareh and the darker-skinned people of Kisua from the south in no small way parallels the connections of old between Egypt and the Nubian Kingdom of Kush. And the world itself is fascinating, with magic serving as the cultural and political building blocks of Gujaareh society. Every member of society is required to contribute to the system by making monthly payments of dreams. These dreams are used by the Hetawa, priests of the dream goddess, as fuel for their healing magic. And since the most powerful dreams are found at the moment of death, an important subset of these priests, the Gatherers (or, as Jemisin calls them, ninja priests), sneak into peoples homes under the cover of darkness to extract dreamblood from those who are deemed corrupt or too elderly to contribute to society, killing them in the process. But what makes this interesting is that these ninja priests do not see themselves as assassins. Ehiru, the protagonist and the greatest Gatherer in Gujaareh, does not assassinate people for material gain. He is a true believer, intending the best for his victims by sending them to reside in the dreamworld of their dream goddess. He kills those deemed corrupt to save them from an even worse fate. And he kills the elderly to ease their pain and to allow them to experience true bliss in the world of the goddess. The Gatherers enter their dreams and ease them into Ina-Karekh, the Hetawa vision of paradise. But regardless of motives, it is a real joy to watch these priests sneak into homes in the dead of night to send their targets to a better place. This is what motivated the novel in the first place. As Jemisin herself notes, "I just wanted to write about ninja priests." The Killing Moon centers around three stories. The first story is that of the Gatherer Ehiru--the greatest of the Hetawa priests. Ehiru mishandles an assassination, which launches him on a journey that pits him against everything he has come to accept in the world. The second story is that of Ehiru's young apprentice, Nijiri, a boy full of youthful ambition and energy who is ever eager to prove himself to Ehiru. And the third story revolves around Kisuan diplomat and spy Sunandi, who seeks to uncover a plot that could threaten the very fabric of Gujaareen and Kisuan society. While on the one hand a political thriller that strikes at the heart, the story at the same time is one of character growth, especially with the two younger characters, Nijiri and Sunandi. Nijiri tries to balance his desire to become a Gatherer with his growing sexual desire for Ehiru, one that can never be fulfilled owing to their priestly vows. And Sunandi is forced to spend time with priests of a religion she hates, only to develop a more complex and nuanced take in the process. But what I really appreciated was the nuanced social mores. Sunandi is by no means a repressed and oppressed woman. She uses her charms and sexuality for personal and for state gain. She will let no man browbeat her into submission. And although she makes mistakes, she is forced to make real decisions that have consequences not just for herself, but for her people. Nijiri, on the other hand, is forced to deal with his own desires for his master. Although his priestly vows (as well as his respect for Ehiru) inhibit him from acting on those desires, what makes this compelling is the very fact that society accepts these homosexual desires as natural, not deviant. In the end, this is an engaging and evocative tale, one I cannot recommend strongly enough. I found so little to dislike that the only quibble I can think of is that I wish Jemisin provided a map to highlight the world's broader geography. 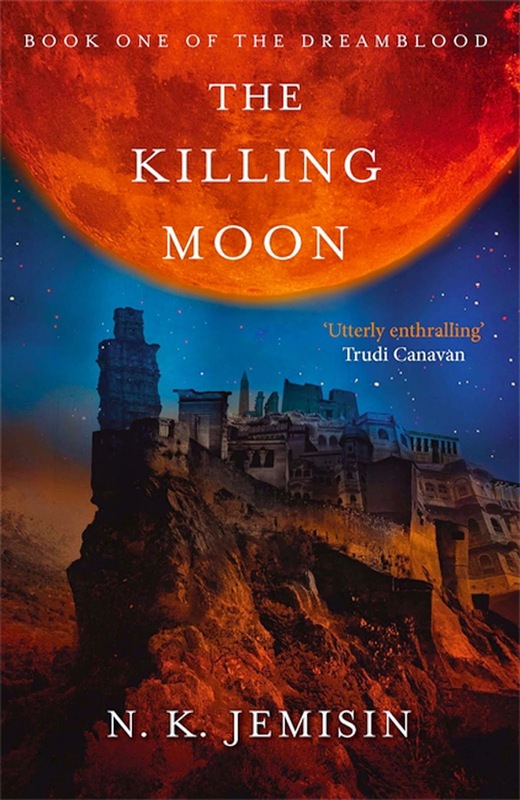 The Killing Moon was such an engaging read that I am surprised it did not win the Nebula Award in 2012. Highly recommended.